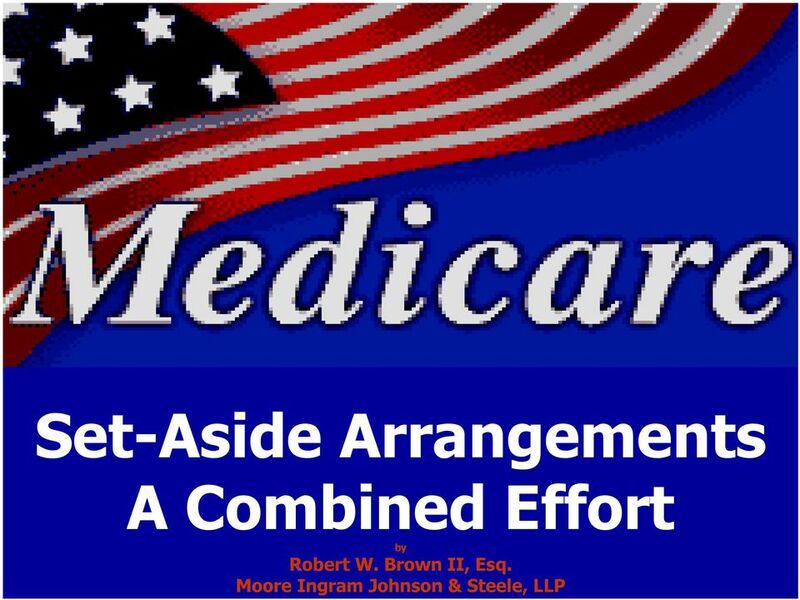 Download "Set-Aside Arrangements A Combined Effort by Robert W. Brown II, Esq. 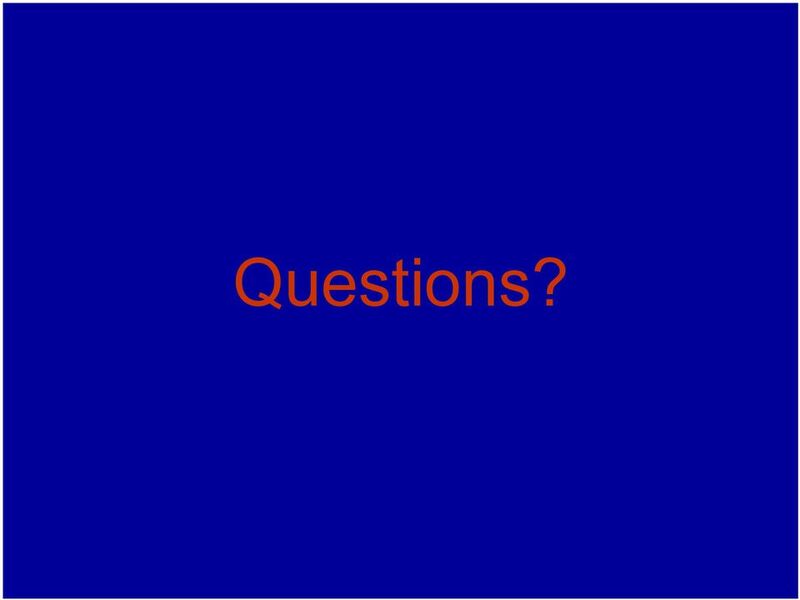 Moore Ingram Johnson & Steele, LLP"
2 Overview: When is Medicare an issue? What is required when Medicare is an issue? Dealing with CMS and Medicare. 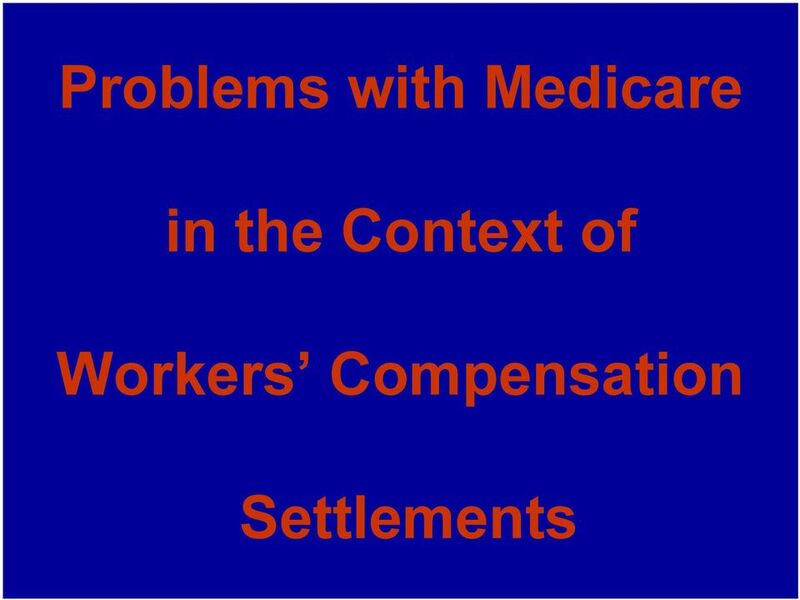 Problems associated with Medicare in the context of workers compensation claims..
3 When is Medicare an Issue? 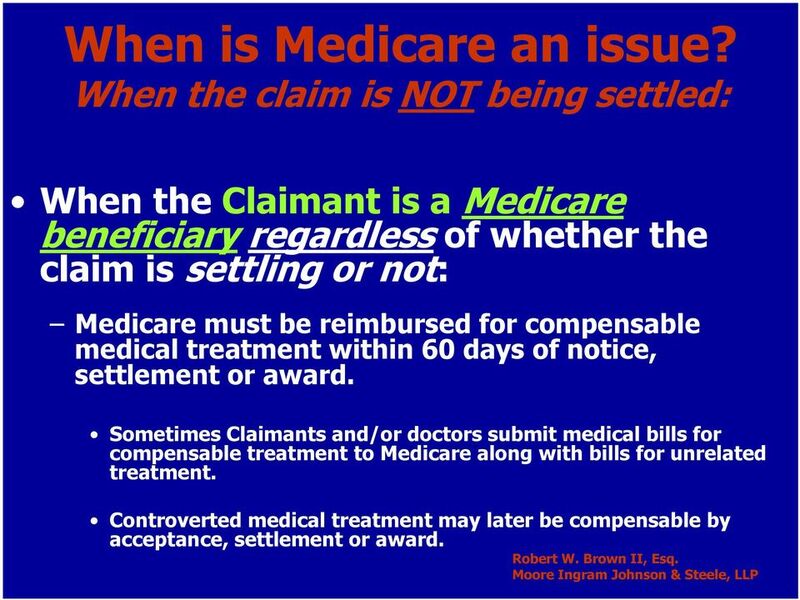 When the Claimant is a Medicare beneficiary regardless of whether the claim is settling or not: Medicare must be reimbursed for compensable medical treatment within 60 days of notice, settlement or award. Sometimes Claimants and/or doctors submit medical bills for compensable treatment to Medicare along with bills for unrelated treatment. Controverted medical treatment may later be compensable by acceptance, settlement or award. When settlement provides for future medical treatment for a work-related injury AND certain conditions exist, a Medicare Set-Aside may be necessary. 4 When is Medicare an issue? 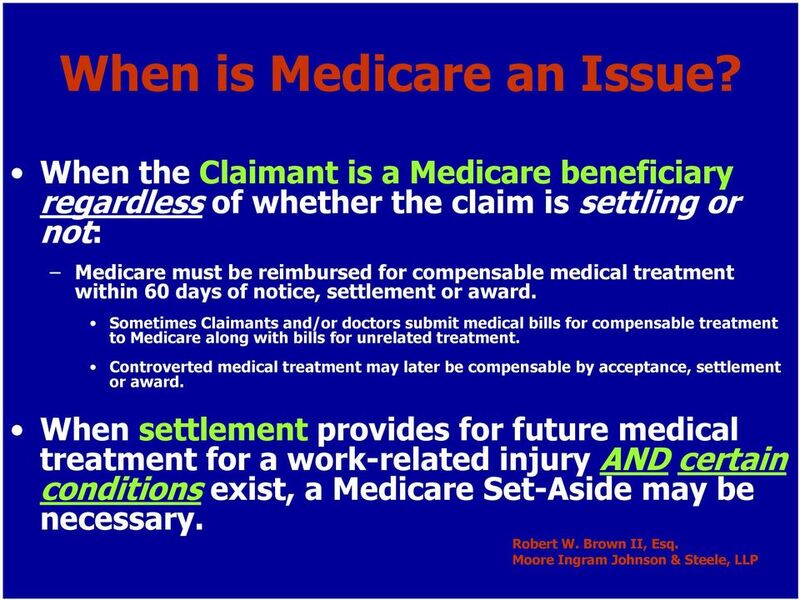 When the claim is NOT being settled: When the Claimant is a Medicare beneficiary regardless of whether the claim is settling or not: Medicare must be reimbursed for compensable medical treatment within 60 days of notice, settlement or award. Sometimes Claimants and/or doctors submit medical bills for compensable treatment to Medicare along with bills for unrelated treatment. Controverted medical treatment may later be compensable by acceptance, settlement or award. 5 When is Medicare an issue? 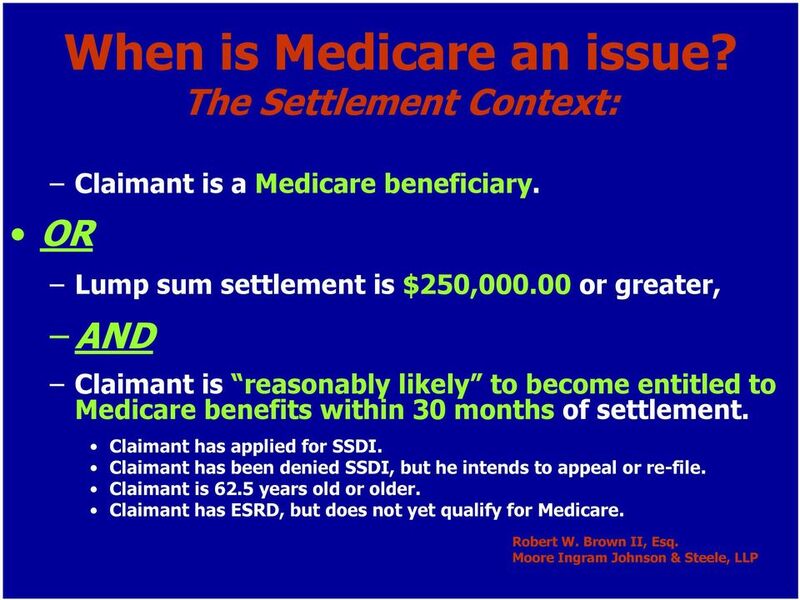 The Settlement Context: Claimant is a Medicare beneficiary. OR Lump sum settlement is $250, or greater, AND Claimant is reasonably likely to become entitled to Medicare benefits within 30 months of settlement. Claimant has applied for SSDI. Claimant has been denied SSDI, but he intends to appeal or re-file. Claimant is 62.5 years old or older. Claimant has ESRD, but does not yet qualify for Medicare. 6 What is required when settling? Adequately consider Medicare s interests when settling a claim. Failure to do so may result in liability for double damages. 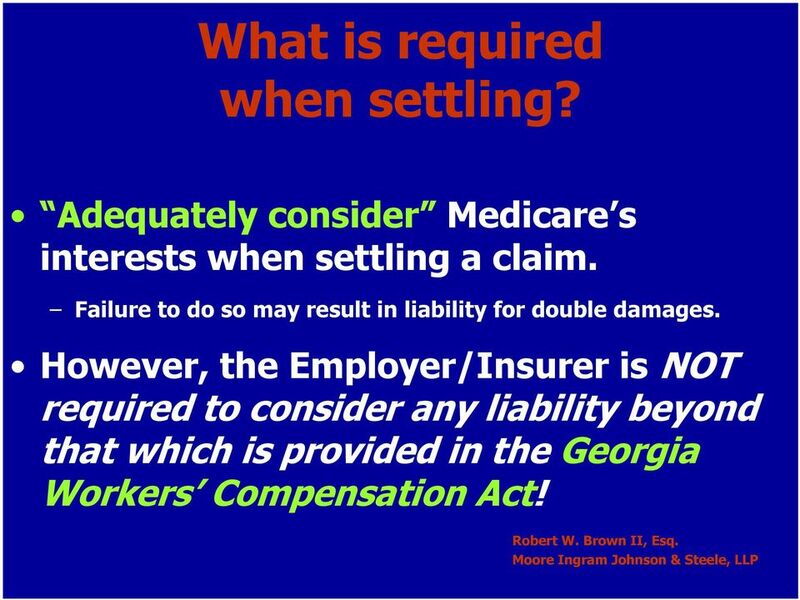 However, the Employer/Insurer is NOT required to consider any liability beyond that which is provided in the Georgia Workers Compensation Act! 7 What does it mean to adequately consider Medicare's interests? Lump sum settlement allocates sufficient funds to cover the Claimant s future medical expenses. A portion of the lump sum must be set aside to cover future Medicare-covered medical expenses. Must include a mechanism which will ensure the funds will not be misappropriated. 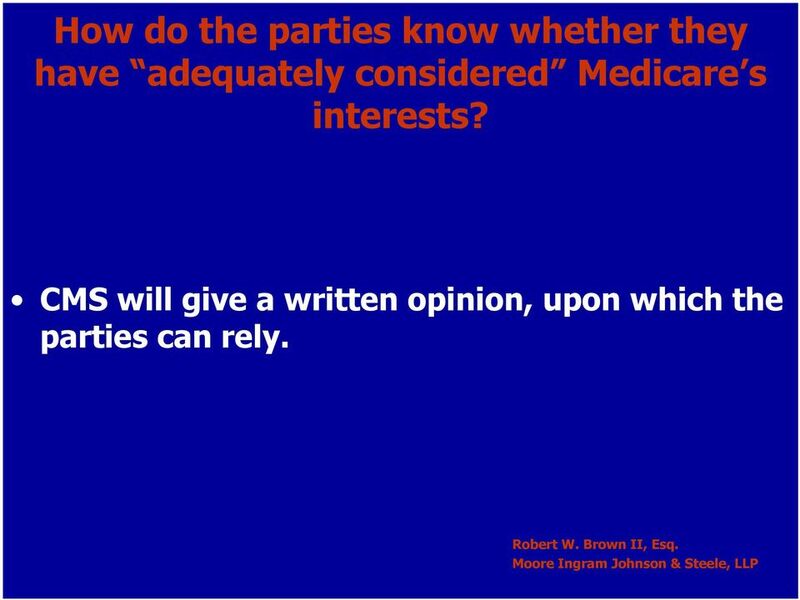 8 How do the parties know whether they have adequately considered Medicare s interests? CMS will give a written opinion, upon which the parties can rely. 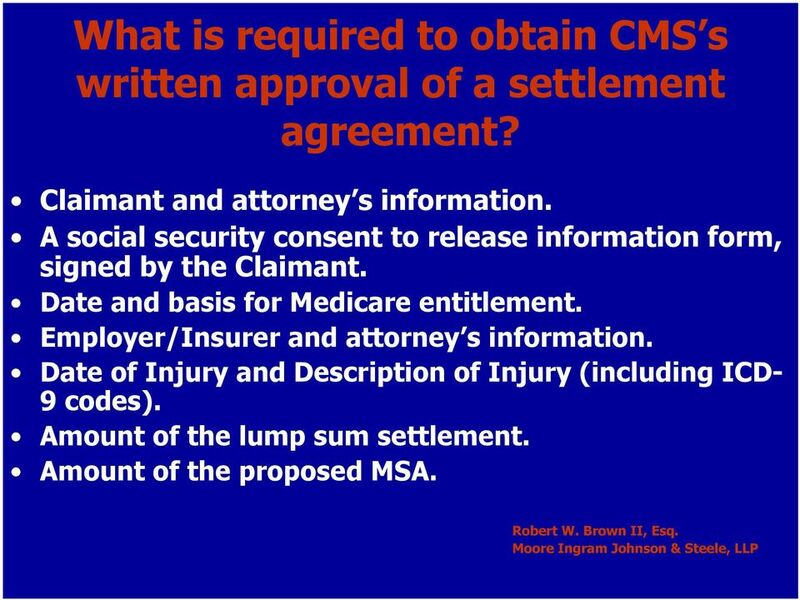 9 What is required to obtain CMS s written approval of a settlement agreement? Claimant and attorney s information. A social security consent to release information form, signed by the Claimant. Date and basis for Medicare entitlement. Employer/Insurer and attorney s information. Date of Injury and Description of Injury (including ICD- 9 codes). Amount of the lump sum settlement. Amount of the proposed MSA. 10 Additional requirements Life expectancy (CDC Table) / rated age. Life care plan / cost projection analysis. Copy of the settlement agreement. Medical records (last two years) documenting: Current medical treatment. Future medical treatment. Prognosis. Maximum expected expenses for all of the Claimant s future medical expenses: Medicare covered. Non-Medicare covered. 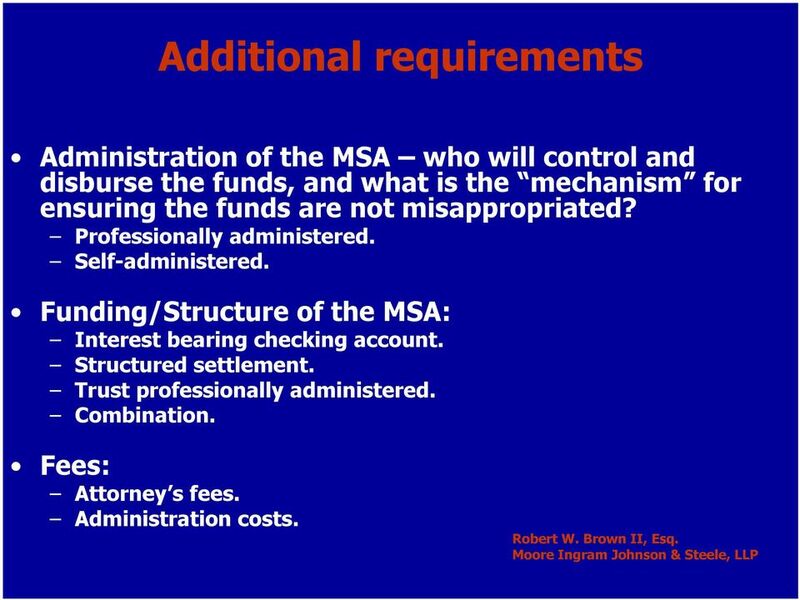 11 Additional requirements Administration of the MSA who will control and disburse the funds, and what is the mechanism for ensuring the funds are not misappropriated? Professionally administered. Self-administered. Funding/Structure of the MSA: Interest bearing checking account. Structured settlement. Trust professionally administered. Combination. Fees: Attorney s fees. Administration costs. 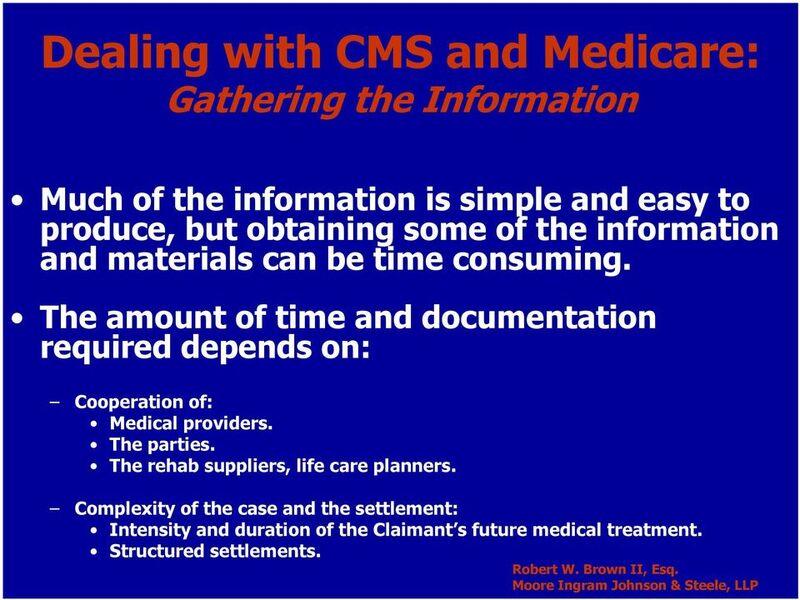 12 Dealing with CMS and Medicare: Gathering the Information Much of the information is simple and easy to produce, but obtaining some of the information and materials can be time consuming. The amount of time and documentation required depends on: Cooperation of: Medical providers. The parties. The rehab suppliers, life care planners. Complexity of the case and the settlement: Intensity and duration of the Claimant s future medical treatment. Structured settlements. 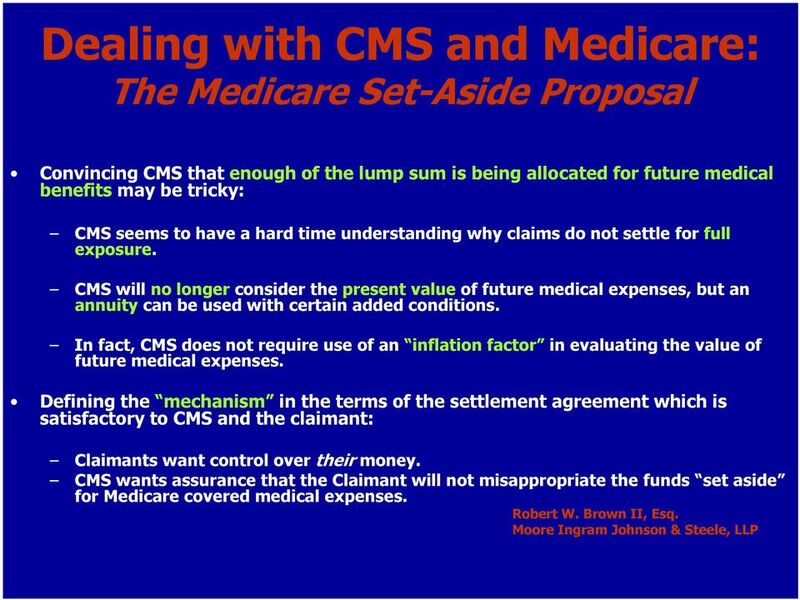 13 Dealing with CMS and Medicare: The Medicare Set-Aside Proposal Convincing CMS that enough of the lump sum is being allocated for future medical benefits may be tricky: CMS seems to have a hard time understanding why claims do not settle for full exposure. CMS will no longer consider the present value of future medical expenses, but an annuity can be used with certain added conditions. In fact, CMS does not require use of an inflation factor in evaluating the value of future medical expenses. Defining the mechanism in the terms of the settlement agreement which is satisfactory to CMS and the claimant: Claimants want control over their money. CMS wants assurance that the Claimant will not misappropriate the funds set aside for Medicare covered medical expenses. 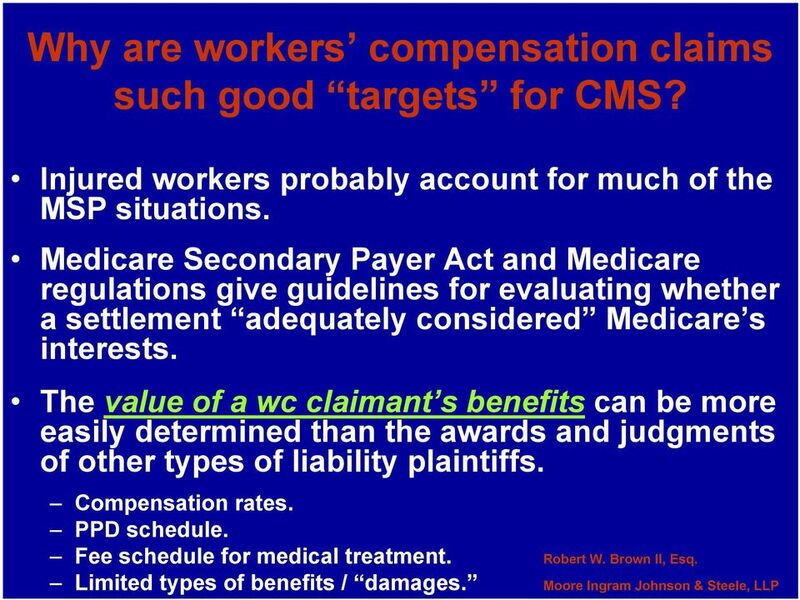 15 Why are workers compensation claims such good targets for CMS? Injured workers probably account for much of the MSP situations. 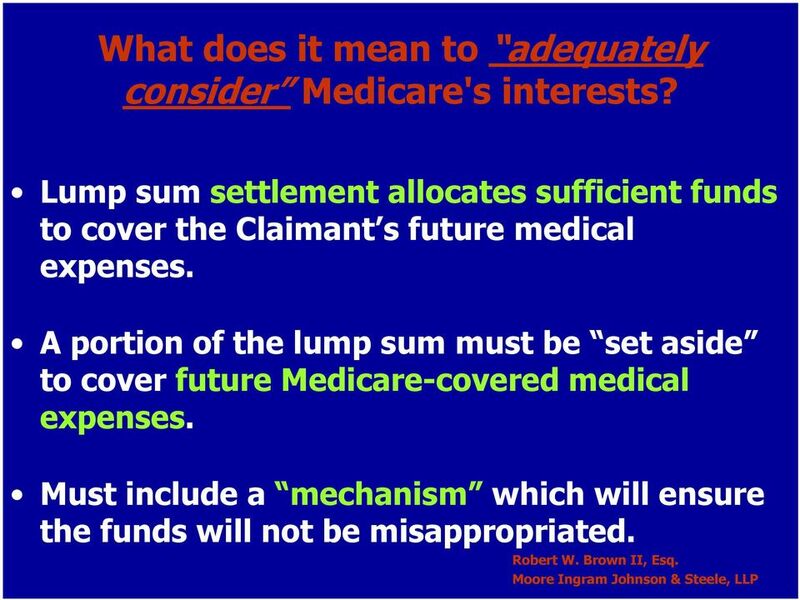 Medicare Secondary Payer Act and Medicare regulations give guidelines for evaluating whether a settlement adequately considered Medicare s interests. The value of a wc claimant s benefits can be more easily determined than the awards and judgments of other types of liability plaintiffs. Compensation rates. PPD schedule. Fee schedule for medical treatment. Limited types of benefits / damages. 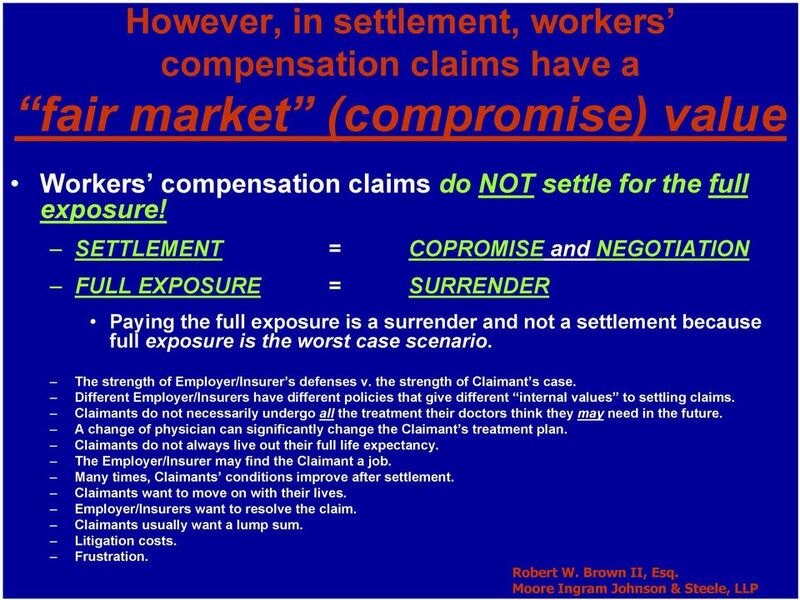 16 However, in settlement, workers compensation claims have a fair market (compromise) value Workers compensation claims do NOT settle for the full exposure! SETTLEMENT = COPROMISE and NEGOTIATION FULL EXPOSURE = SURRENDER Paying the full exposure is a surrender and not a settlement because full exposure is the worst case scenario. The strength of Employer/Insurer s defenses v. the strength of Claimant s case. Different Employer/Insurers have different policies that give different internal values to settling claims. Claimants do not necessarily undergo all the treatment their doctors think they may need in the future. A change of physician can significantly change the Claimant s treatment plan. Claimants do not always live out their full life expectancy. The Employer/Insurer may find the Claimant a job. Many times, Claimants conditions improve after settlement. Claimants want to move on with their lives. Employer/Insurers want to resolve the claim. Claimants usually want a lump sum. Litigation costs. Frustration. 17 Projecting future medical expenses MUST take into account the fair market (compromise) value of the claim! 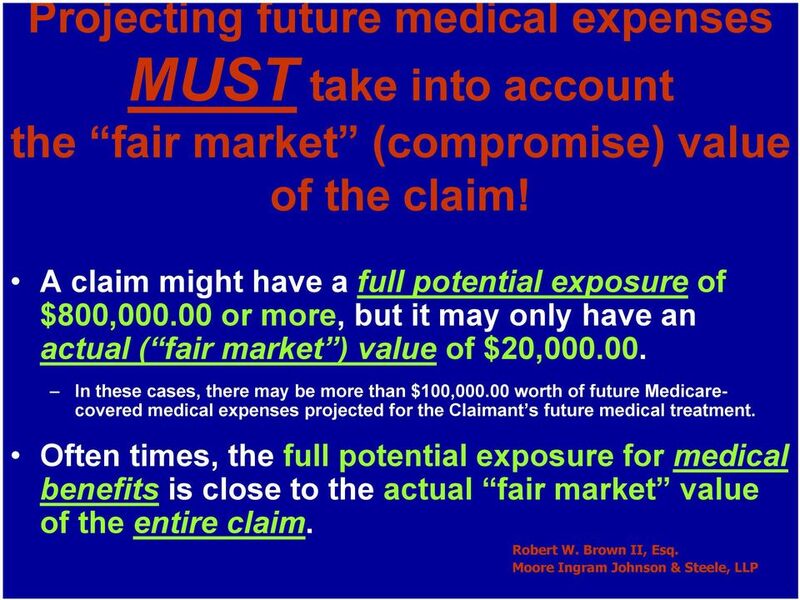 A claim might have a full potential exposure of $800, or more, but it may only have an actual ( fair market ) value of $20, In these cases, there may be more than $100, worth of future Medicarecovered medical expenses projected for the Claimant s future medical treatment. Often times, the full potential exposure for medical benefits is close to the actual fair market value of the entire claim. Medicare Issues in Workers Compensation Settlements PRESENTED BY: MICHELLE A. ALLAN, ESQ. MEDICARE AND LIABILITY CASES I. The Significant Statutory and Code Provisions A. The Medicare Secondary Payer Statute The Medicare Secondary Payer statute (MSP) has been the law for well over 25 years. 135 West Bay Street, Suite 400 Jacksonville, FL 32202 Phone: (904)598 1110 or (877)596 5705 Fax: (904)598 1081 erin@deltasettlements. SUBROGATION AND MSAs. Settlement of W/C Claim As Part of Third Party Settlement Commutation/Dollar Contracts, Etc. USING MEDICARE SET-ASIDE ARRANGEMENTS IN THIRD PARTY LIABILITY CASES By: Thomas D. Begley, Jr. Structured settlements currently play an important role in compliance with Medicare s Secondary Payer Act. CMS Review Thresholds CMS Referral Request A workers compensation settlement may qualify for referral to The Centers for Medicare & Medicaid Services (CMS) under the following review threshold criteria. MSA s Insurance Discussion June 22, 2011 Bruce Slayter Managing Director MSA Handling Watch out for the trap of complacency. Why are we doing this? Is it right? Is it compliant with the law and ethical? Subrogation and Liens: Basic Principles and Practical Considerations. Brandon E. Berg Thompson, Coe, Cousins & Irons, L.L.P. Presented by Bradford & Barthel, LLP Sherri M. Dozier, Director of Client Development and Relations Large Loss Department Specialist Approximately 12.4% of Gross Wages (F.I.C.A) pay for Social Security. 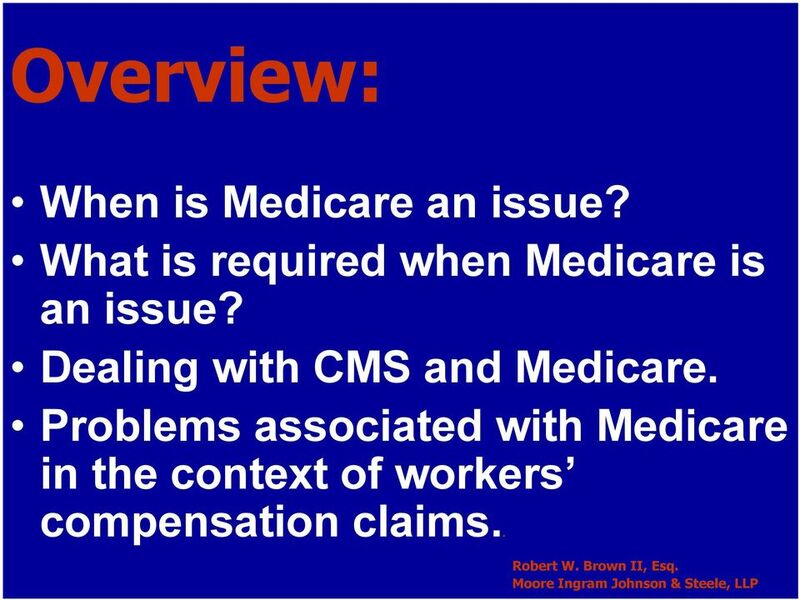 Workers Compensation & Medicare Set-Asides"
Best Practices for Complying with New Medicare Reporting Requirements What Every Attorney Needs to Know By Ervin A. Gonzalez, Esq. 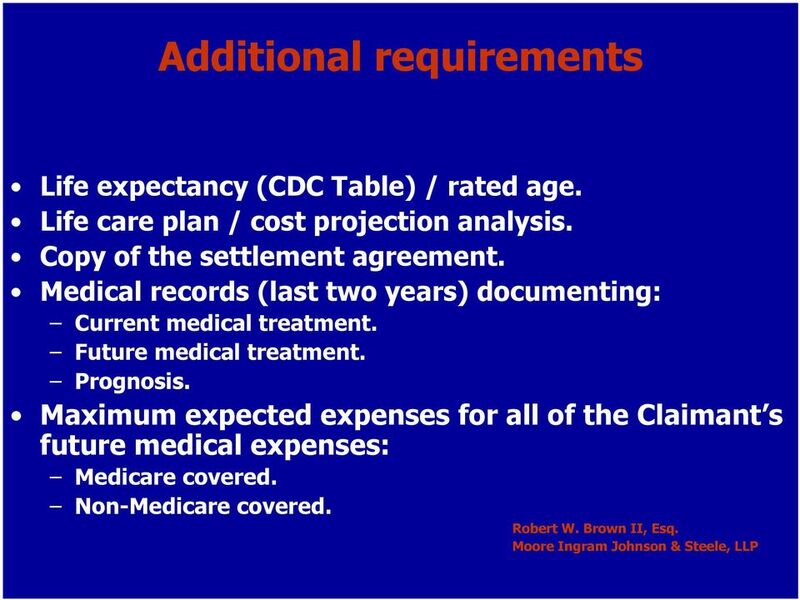 Best Practices for Complying with New Medicare Reporting Requirements What Every Attorney Needs to Know By Ervin A. Gonzalez, Esq. I. Overview: How does the MMSEA impact personal injury and mass tort settlements? STRUCTURED SETTLEMENTS. Presented by Kerri Morin Atlas Settlement Group, Inc. Welcome to the Reportable Claims course. Settlement Philosophy BWC Settlement Update Sessions 603 & 633 Ken Brown Project Lead, LSS Enhancement Team Settle the right claim, for the right value, at the right time, under the right circumstances. .25 Schedule of [Attorneys'] Attorney's Fees. SUBROGATION THE RIGHT OF YOUR HEALTH INSURER TO BE PAID BACK WHEN YOUR CASE SETTLES Subrogation: the legal right of an insurance company to be paid back for benefits paid on your behalf after your accident. Creative Settlements & Medicare Set-Asides Presented By: Stephen P. Largent, Esq. Medicare Update: Information to Help with the Darkness of Medicare Compliance. Peter H. Wayne IV, Esq. This article presents general guidelines for Georgia nonprofit organizations as of the date written and should not be construed as legal advice. Always consult an attorney to address your particular situation. Welcome to the Medicare Secondary Payer (MSP) Overview course. Instructions for Completing the Represented Settlement Agreement Please read all pages This form is fillable. That means you can type the information onto the form from your computer and print the form. Hospital Liens, Medicare and Medicaid: Trouble Ahead? Medicare Indemnity and Defense by Federal Mandate?